What is the difference between tree trimming and pruning? While many regard the two terms as interchangeable, we look at it as a little more nuanced than that. Tree trimming is bit a more utilitarian category than fine pruning work. While still maintaining the same principles that promote a healthy tree when the work is completed, we look to meet the homeowner’s objectives when doing tree trimming. Are there dangerous or excessively heavy limbs overhanging the roofline of the house? Are the branches growing up into power lines or communication wires? Is there a storm risk in high winds or ice of branches losing integrity and causing property damage? We assess these and many other factors when we trim back a tree. Lightening long limbs greatly reduces the chance of breakage in wind and storm conditions. Even if the goal is to reduce the overall size and control growth in a tree, we look at the overall picture and select the best limbs and cutting points to bring the tree back to a proper, healthy place. So the end result will be one of pleasing shape and beauty for years to come. Here is a list of how we look at a tree and decide what to do with it to make it look better and healthier. Assess the tree: take a few minutes to really look at the size and how it will look once the trimming is finished. Identify all major branches that make up the skeleton of it: Want to be sure not to cut the branches that give the tree its overall shape. Removal of branches that look damaged first: trimming these branches help water and nutrients to be redistributed to the healthier ones. Thin the areas that are thick: this helps light and air pass freely to other limbs. Branches need good air and light circulation to remain healthy. Get rid of obstructing limbs: This helps to get rid of those limbs that are in the way of walkways, power lines, hanging on your roof, or hanging over the roof. Trim limbs to shape the tree: doing this helps to give it the shape you want. Trim as little as possible: each time you trim a tree, it compromises the protection system and opens it to infections from insects or fungus. We never trim more than 33% of a tree. With our help, you can gain the look you want for all the trees in your yard. We strive to make sure they are beautiful and healthy. 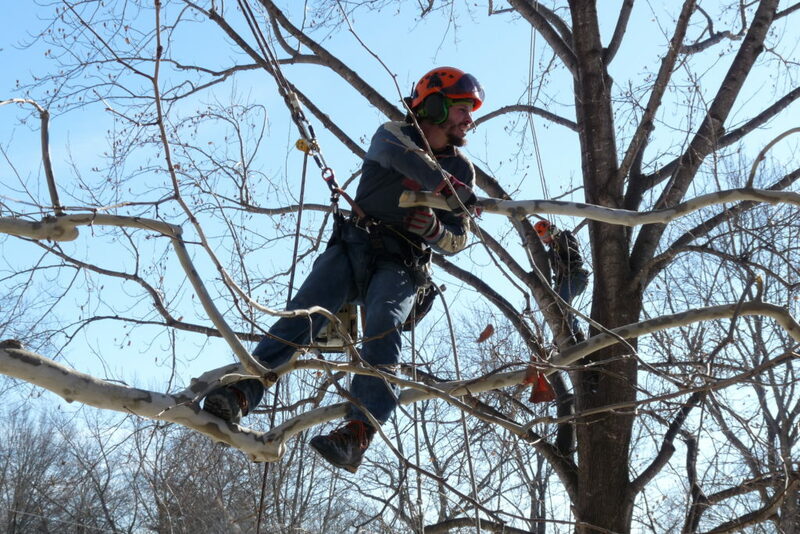 When you need our tree trimming services, give us a call at (785) 430-4343. Why does a tree trimming cost so much? 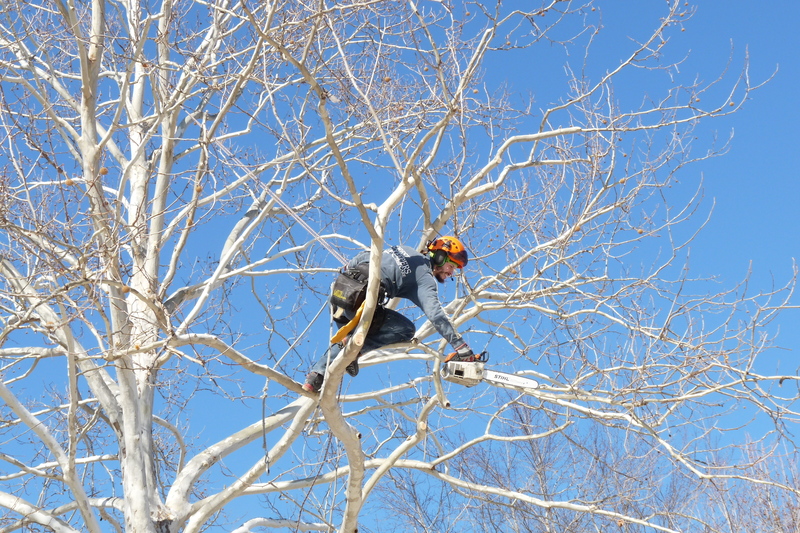 Unlike some trades that work for an hourly rate, tree work is unique. It requires a dedicated team of skilled tradesmen well versed in arbor skills. You are not only getting the best industrial arbor care equipment (brush chipper, dump truck, grapple truck, professional-class chainsaws, proper ropes and rigging equipment)… You are also getting a wealth of experience. Literally decades of knowledge and experience stand behind the work we do. So we can safely and effectively meet your tree care objectives — whether fine pruning, tree trimming or reduction. If you need a quote for your tree care project, please give us a call or e-mail us, and our friendly arbor care specialists will be glad to answer any questions. What is the timeline for completion? Depending on the amount of work and location, most projects can be completed in 1 to 2 days, depending on the scope and equipment required. During the winter months we usually have a shorter lead time, but spring and summers can be booked up to a month in advance. But of course, we are always available for emergency work and will try our best to accommodate your schedule. What is the approximate cost for tree pruning? The total budget may vary as sizes of trees are very different, and hardwood vs. softwood is a factor, as well as how much brush and debris a tree will generate. Proximity to houses, outbuildings, fences, and power lines are also major factors, as it will increase the amount of rope rigging to safely lower limbs to the ground. Larger jobs can also require more manpower and equipment, sometimes even hiring additional crane service. Generally, tree trimming or pruning ranges from $150 to $2500, depending on those and other factors. How do we get going? We are here to serve you, so a tree care project can be initiated by you, the client. If you need tree care services, simply call or click on the Request Quote button and our estimator will arrange a time to come out to look at your trees.